This Quick Start sets up an AWS architecture for the Couchbase Data Platform and deploys these products into your AWS account in about 10 minutes. Designed to power engaging mobile, IoT, and web applications, the enterprise-class Couchbase Data Platform includes Couchbase Server and Couchbase Mobile. Couchbase Server is a cloud-native, NoSQL database designed with a distributed architecture for performance, scalability, and availability. It enables developers to build applications by leveraging the power of SQL with the flexibility of JSON. Couchbase Mobile includes a fully integrated embedded database, built-in security, and real-time automated sync with the highly scalable Couchbase server. 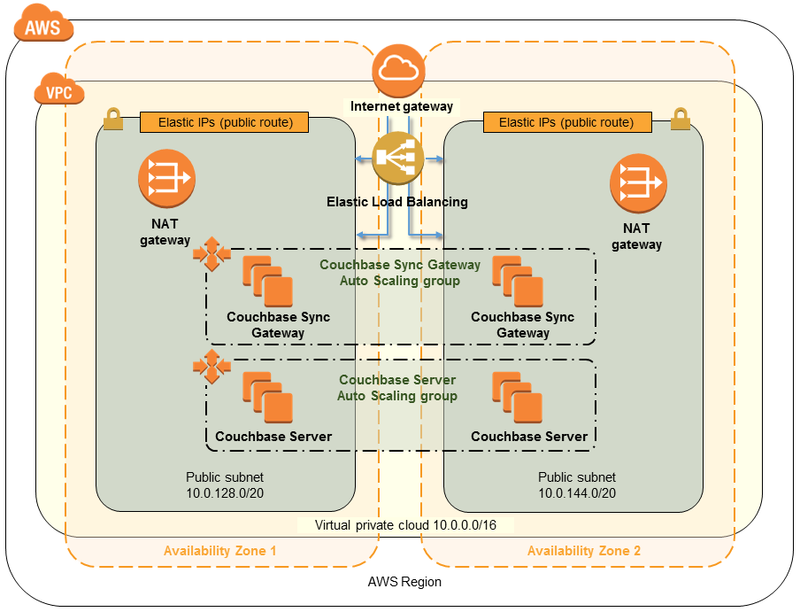 The Quick Start deploys Couchbase into a new or existing infrastructure in your AWS account. It uses Amazon Machine Images (AMIs) from AWS Marketplace, and provides two subscription options: Bring Your Own License (BYOL) or hourly pricing. The deployment is automated by AWS CloudFormation templates that you can customize during launch. This Quick Start was developed by Couchbase and ClearScale in collaboration with AWS. Auto Scaling groups and launch configurations for Couchbase Server and Couchbase Sync Gateway. By default, the Quick Start deploys four Couchbase Server instances and two Couchbase Sync Gateway instances. If you want to provision more instances, you can change these defaults during deployment. Subscribe to the Couchbase Enterprise Edition AMIs in AWS Marketplace. Test the deployment by accessing the Couchbase Web Console and the Couchbase Sync Gateway API. To customize your deployment, you can choose the number of Availability Zones (2-4) for your Multi-AZ deployment and customize the configuration of the Couchbase Server and Sync Gateway nodes. Bring Your Own License (BYOL) – If you already have a valid subscription to Couchbase software, you can use that license, subject to complying with standard licensing terms. Additional pricing, terms, and conditions may apply. Hourly pricing – Prices are calculated according to your usage and reflected in your monthly report.